I was originally going to make pancakes this morning, but the picture of the pecan sauce above the recipe got Mom's attention yesterday, so I decided not to make pancakes with vegetables today and to make the sauce to go with them in a few days from now. So I thought of Eggs Florentine, but I'm not much for hollandaise, nor did I want to attempt it this morning without any knowledge about it whatsoever. But this seems similar enough, but it gets its flavor from garlic. We have an egg poacher, so this recipe uses one, but you could also poach the eggs in water, I just haven't quite figured out how to get the eggs in one piece. Grease the cups of the egg poacher. Bring water to a simmer below rack for the cups. In a medium skillet, heat the olive oil over medium heat. Add the garlic and sautee 30 seconds to a minute, or until slightly golden. Add the spinach and sautee for an additional two minutes, or until all spinach is at least wilted. Meanwhile, crack each egg into a cup of the poacher. Cook, covered, for 4 minutes or until whites are completely set. On a baking dish, pan or sheet, place toasted English muffins, insides facing up. 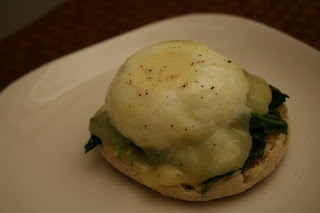 Divide spinach among English muffins. Place one egg on top of each. Top with a slice of cheese and place 4 inches under broiler for 15-30 seconds, or until cheese is melted.